This is a tool for testing if you device has root access and verifying if it does. This tool also gives you system information about your device including model number, device name and manufacturer. 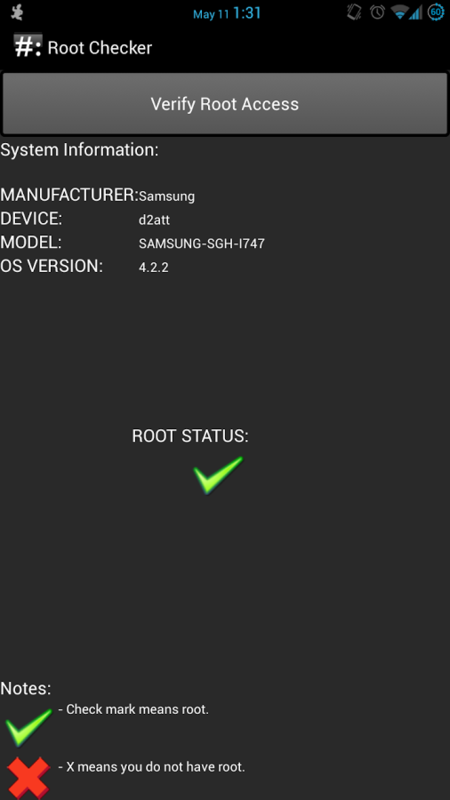 This application will not root your device but serves as a tool to verify your root access. When you run the application if you get a check mark this means you have root access and if you get an ‘X’ you do not. I can not guarantee that the application will be 100% accurate. If you have any questions or need to contact me you can get ahold of me on my website CMDann.ca I appreciate your feedback. I would like to give credit to Adam of XDA-Developers for his Shell code. I would also like to thank Grandel Cuvos as my offical beta tester. Thank you to everybody who has submitted feedback on here and on my site.